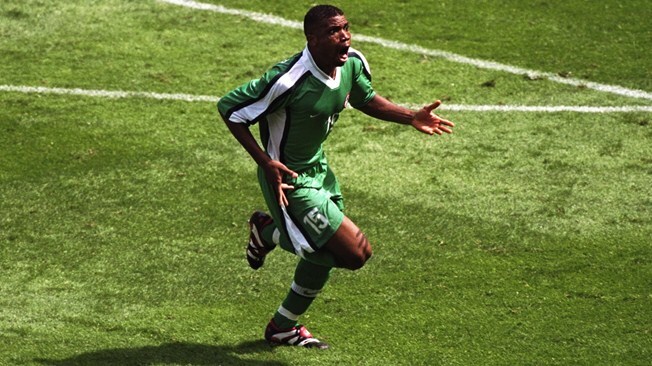 Home Football Nigeria’s Top 5 World Cup matches ever! From 1994 to 2014, Nigeria’s Super Eagles made five World Cup appearances, and yes most of the games played in those tourneys still reverberate in the minds of fans who watched the matches then. Depending on your demography or when you started watching the Super Eagles, some of Nigeria’s past World Cup matches still elicit excitement, while some no doubt resurrect a melancholic feeling of what would have been if the outcomes of those duels had been different. Of the five World Cup appearances, Nigeria have played a total of 18 matches, making it to the Round of 16 on three occasions, and are yet to progress past this stage. In this story, we would go down memory lane and look at Nigeria’s Top 5 World Cup matches ever. Interestingly, these best five games were played in 1994, 1998, 2002 and 2014. Only at the 2010 edition in South Africa, did the Super Eagles not produce a pulsating and nerve wrecking game that left us craving for more. Yes! 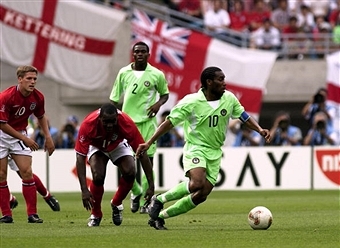 That game between the Super Eagles and the Three Lions of England at the 2002 World Cup was one of Nigeria’s best World Cup matches ever. A dead rubber match with nothing at stake for Nigeria, it was a game premised more on pride for the Super Eagles than for England who knew a point would see them through to the next stage. Although the game ended in a 0-0 draw, it was far from a dour contest, with both teams having a real go at winning the game, and really, the game could have gone either way. Don’t know what game brought Vincent Enyeama to the limelight? 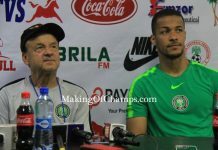 It was this encounter that launched his career, as then coach Adegboye Onigbinde threw him in the deep waters to face an England team brewing with Premier League stars. Emile Heskey and David Beckham came close to finding the net, only to be repelled by Enyeama, with Austin Jay Jay Okocha testing David Seaman at the other end. With Benedict Akwuegbu and James Obiorah leading the lines in attack, it was the latter who came the closest to scoring for Nigeria, and at the other end, Enyeama announced himself to the world after making a remarkable safe to deny Paul Scholes’ venomous long range strike, getting his right arm to it and pushing it out of the post. Afterwards, Michael Owen came close and Akwuegbu almost found the net, if not that he shot directly at Seaman. 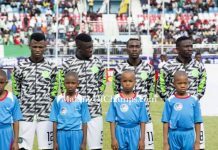 Why this match was being slated as one of our best matches ever was how well the fringe players who were making their first appearance at the tournament, with Nigeria having lost the first two games, held their own and matched the English team. It was a very open game that was entertaining, and the squad players who featured that day, gave a good account of themselves. Of the four clashes between the Super Eagles and Argentina at the World Cup, this has to rank as the best performance the Nigerians have put up against the Albiceleste. Although some would argue that the 1994 match-up was entertaining too, and that the 2-1 loss wouldn’t have happened if Diego Maradona who had tested positive to drugs then, was found out early enough and Claudio Cannigia’s controversial second goal ruled out by the Swedish referee Bo Karlsson. 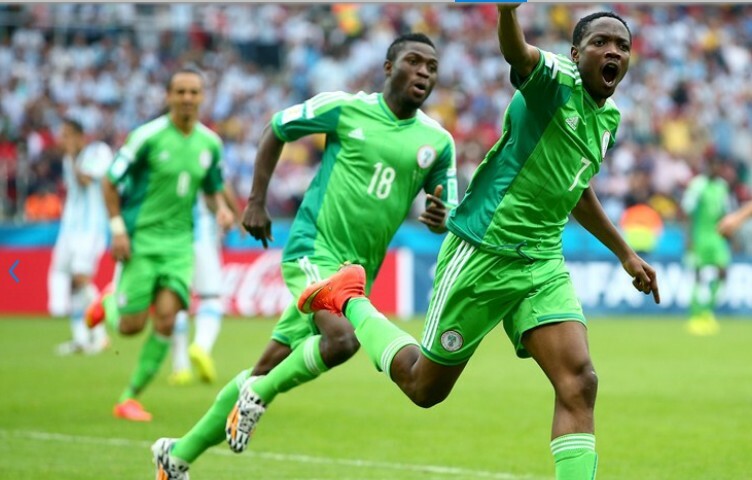 That said, the 2014 clash at Estadio Beira-Rio Porto Alegre was one of Nigeria’s best performances against Argentina. Unlike in 2002 and 2010 when the Super Eagles hardly got out of their own half, in 2014 they scored two good goals against them. Argentina with the maverick Lionel Messi conducting the orchestra for them, cut Nigeria open inside three minutes, but minutes later Ahmed Musa responded with a curler that found the top right corner to level things for Nigeria. The Albiceleste dominated and probed for more goals, with Vincent Enyeama repelling them till the last minute in the first half when Messi’s free-kick put his side back in the lead. Musa continued where he left off, and a brilliant one-two with Emmanuel Emenike saw him played through on goal making no mistakes finding the bottom corner. Argentina did find the winner through Marcos Rojo, but Nigeria could have also found an equalizer if John Obi Mikel had clinically taken the chance that he got, and if Osaze Odemwingie’s ambitious effort had beaten Sergio Romero. Of the last three games before that, Nigeria had only scored one goal against Argentina, but found themselves scoring two in a game. There’s going to be a fifth contest next year, and going by the recent 4-2 victory by the Nigerians, another enthralling match seems to be on the horizon. Doubt there were many who thought Nigeria would ever beat Spain after the Super Eagles were drawn against the Europeans when the draws were made. 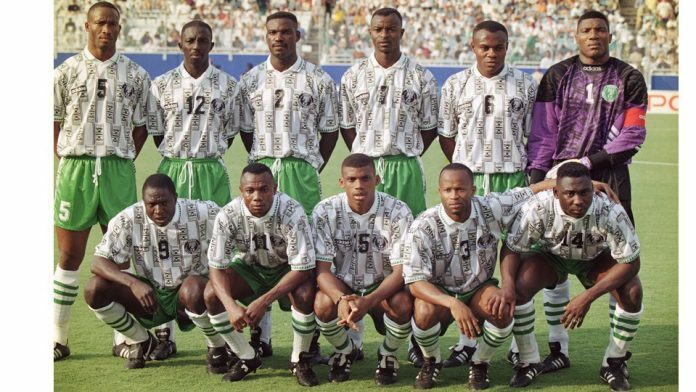 Although the 1994 exploits should have served as a deterrent to anyone who wanted to write off the Super Eagles, some off-the-pitch issues hampered Nigeria’s preparations for the tournament. Facing a Spanish side that had the likes of Raul, Fernando Hierro and Luis Enrique, Nigeria stunned them in their opening game, handing the Europeans a 3-2 defeat. Spain had the stars and it showed when they took the lead in the 21st minute through a deflected strike from Hierro’s free-kick. However, Nigeria clawed their way back seven minutes later through the “headmaster” Mutiu Adepoju heading in a corner. It looked like normal service was restored when Raul left Mobi Oparaku trailing to flick his side ahead two minutes after the restart. Nigeria kept going though and Andoni Zubizarreta’s error saw Garba Lawal equalize 2-2. However, the moment of the game that will remain indelible in the minds of Nigerian football fans, was Sunday Oliseh’s thunderous strike from long range to put Nigeria 3-2 up. It was Nigeria’s first match at that World Cup, but the celebration was so effusive that it seemed they had won the tournament itself. Anyone who watched this game in Nigeria would remember how it was almost a public holiday (although an unofficial one), with the streets empty as everyone rushed home to watch the country’s representatives in action. While there’s a tinge of bitterness resonating again on recounting this game, one finds solace in the fact that Nigeria came within two minutes to inking their names forever in the annals of football folklore. 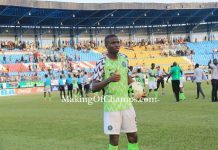 Nigeria had gone in front in the 25th minute through Emmanuel Amunike whom a rebound fell to, and he skillfully guided it past Italy’s goalkeeper Luca Marchegiani. It looked like the giant slaying was going to continue, more so after Gianfranco Zola was shown the red card 10 minutes after he came in as a substitute, but prior to that, Amunike’s injury and subsequent substitution took away a sting in Nigeria’s attack. In hindsight, one wonders what would have been if Paolo Maldini had been sent off for deliberately impeding Rashidi Yekini who was goal-bound, and Italy reduced to nine men. Just two minutes to regulation time, Roberto Mussi had overlapped into attack, skipped past a Nigerian defender and slid through a square pass for Roberto Baggio to drill home the equalizer into the bottom right corner beyond Peter Rufai. The Nigerians didn’t recover from that and despite playing with a man advantage, were undone by another Italian defender Antonio Benarrivo who won a penalty kick on Austin Eguavoen. 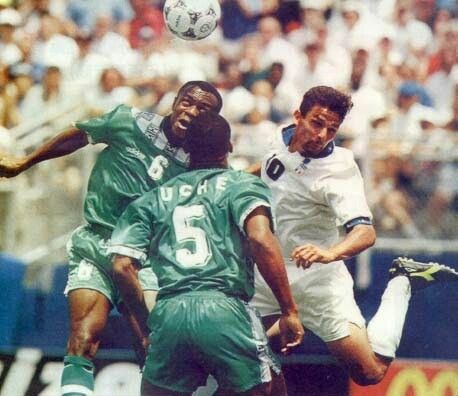 Although Baggio got his brace from the spot, Nigeria had a good chance of drawing level, with Michael Emenalo finding Yekini, but his first touch let him down and he couldn’t get the connection needed to finish off. It was a heart-wrenching moment for Nigeria, but they exited the tournament with their heads high and afterwards climbed up to fifth place on the FIFA ranking. By the way, it’s still being talked about as that has been Nigeria’s highest placement ever. So it must be said that it was a straight fight with No.2 (the match against Italy) for which match is Nigeria’s best performance at the World Cup. This game against Bulgaria trumps others. Being Nigeria’s first World Cup match ever, many were eager to see what cloth the African champions were cut out from. Having won the continental crown six months earlier in Tunisia, it was time to face the world. Not perturbed by the conflicting time difference with USA, Nigerians milled around their television sets and that of their neighbours in the wee hours of the morning to watch this game. 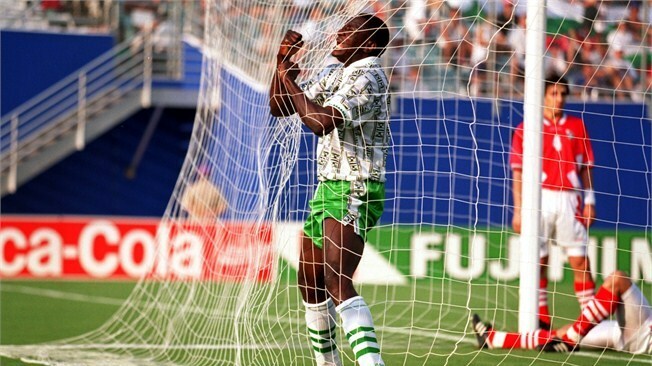 Who can forget this glorious moment when Rashidi Yekini of blessed memory scored Nigeria’s first ever World Cup goal. Daniel Amokachi picked out Chidi Nwanu who was in an open channel and the latter looked up to cutback for Yekini who glided home the opener after twenty minutes with his left foot. One soon became two as Yekini turned provider with a probing pass into the box which the Bulgarian defenders made a mince of, but Amokachi had the best reactionary instinct, pushing the ball past the onrushing goalkeeper Borislav Mikhailov, and on his turn, found the angle to score the second. Amunike’s glancing header met Finidi George’s incisive cross to head Nigeria into a 3-0 lead, and the rout was complete. That was a game many who watched then still drool over, and applaud an assemblage of talented players who didn’t tremble in trepidation on taking the world. There were so many iconic moments in that game, all capable of making a good stock of World Cup memories and montage from, from Yekini’s net celebration to Amokachi’s waist spinning dance, a lot that would be forever entrenched in our memories. Coincidentally, Nigeria was ranked no 5 by FIFA ahead of the 1994 World cup.For me,the Nigeria vs Bulgaria match remains the most memorable and classical match by the Super Eagles. The most painful being our loss to Italy at the dying minute.Till date,that 1994 team stood the best chance of moving to the final stages of the World Cup. The current team,no matter what the critics might be saying and if God prevents them from avoidable injuries en route to Russia, may turn out to be the team to beat.Their 4-2 bashing of Argentina is a morale booster.Reassuring the team that no country is beyond being trounced at the field of play.Our attacking ‘arsenals’ may turn out to be the nemesis of some so-called football superpowers in the hands of the Super Eagles who have now become the terror of Africa! You are on point man!! !